How do you keep yourself headed in the right direction? 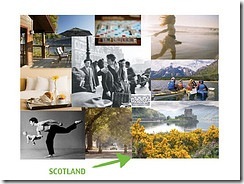 A vision board is a very powerful tool to help keep your mind focused on what you want. Think of it as a life map with your desired course plotted out visually in attractive pictures. I recently wrote an article titled How Do Decide What You Want. If you missed it, you might want to take a minute to read it, but I’ll restate the basic premise now. The key to getting what you want is knowing exactly what you want. 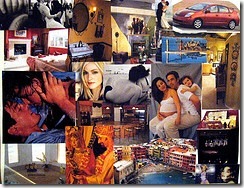 A vision board can help you clarify what you want and keep you focused on it. The better job we do at this, the more likely we are to realize the life we truly desire. Think of life as a drive down the main strip in Las Vegas. There are a lot of interesting attractions to the left and to the right. Now we might have departed our hotel with a destination in mind, but it is incredibly easy with all those bright lights, big signs and interesting looking buildings for us to get sidetracked. We might decide to stop and check out a few of the more interesting sights along the way. This is all right, but it delays us from getting to our original destination. In a bit, we may look up at the clock and realize it is very late and we’re never going to reach our goal. This is where a vision board can help. If when we left our hotel, we had brought along the attractive brochure that vividly depicts and describes all the great things about our original destination and we kept looking at that on our way, then we wouldn’t have been as tempted by all the other attractions along our path. We would have remained focused on where we were going which would have helped us to arrive in a timely manner. A vision board creates this same focus for our goals. What exactly do I mean by focus? Well, here are a few definitions that break it down. A vision board helps us to keep our mind, which is the most powerful asset we have for reaching our goals, focused in the direction we want it going. Images have a very strong influence over our brains. Why do you think television is such a strong medium for advertising? Because advertiser’s know we remember images. Images get planted deep in our mind’s eye and are more easily recalled than just words alone. We can take advantage of this feature of our brains by using a vision board to focus our minds in a more concentrated manner on the specific things we want to achieve, acquire or accomplish. Think about it for a moment, when we obsess over something, we usually get it. We can intentionally apply this same principle using a vision board to create the life we most desire. 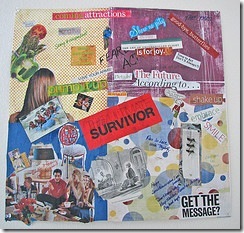 Creating a vision board is simple and inexpensive, yet it is a very powerful tool. How cool is that? You can get a lot of bang for your buck here. Let me take just a moment to say that most people will never take the actual step of creating a vision board. They’ll dismiss it as hokey. They’ll intend to, but never get around to it. They’ll start, but never finish. This is what separates the winners from the losers in life. Winners do the things that lead to success. They act decisively on the activities that move them closer to their goals. They make important, high-leverage actions the priority in their lives. This is what makes them winners. Creating a vision board is an important, high-leverage action you can easily take to significantly improve the likelihood of getting what you want. The question is, will you do it? You want to be sure that your vision board is a true reflection of what you actually want. Therefore, I’d recommend doing a little up front work to properly define this. I provided some recommendations in How To Decide What You Want to help you zero in on what you most desire. As with most things in life, you are going to get out of this exactly what you put into it so, take you time and do it right. If you need more inspiration on what to add to your vision board then I suggest you take a stroll over to Pinterest as there are many great examples of vision boards. I recently created my vision board and here’s what I used: a large piece of poster board, a bunch of old magazines, a glue stick and scissors. It is as simple as that. There are also software apps you could use, but why? I like having my vision board large and hanging on a wall. I suggest sticking with the basics that keep the cost low and return high. I laid everything out on my dining room table and started leafing through some of the magazines looking for pictures and words that idealized my vision. If you’ve done a good job at Step 1 above, then you should know exactly what kind of things you are looking for. Once you find them, cut them out and paste them to your poster board creating a collage of what you want your future to look like. I have included a few examples off Flickr so you can see what others have done and what these things look like. 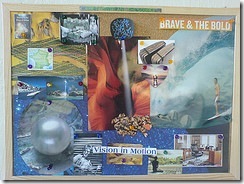 Once you have constructed your vision board, then you need to hang it in a place where you’ll see it often. I put mine in our walk-in closet in the master bedroom. It is right above the light switch so I see it multiple times per day. Be sure to take a few moments daily to focus your attention on your board soaking in the images. Think about how you’ll feel once you get the things on your vision board. A strong emotional connection will help you to reach your vision even faster. Trust me, vision boards really work. They keep what you want in the forefront of your mind. This naturally makes you more receptive to “seeing” opportunities to pursue your vision when they present themselves. It gives you that focused, concentrated, clarity that will make things happen for you. They may not happen overnight, but you’ll be amazed at your progress just a year from now if you’ll follow the steps above to create your vision board.